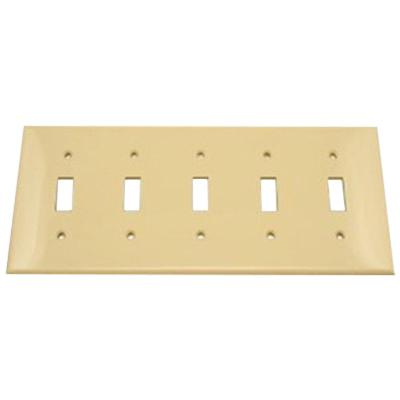 Leviton Standard Size 5-Gang rectangle wallplate in ivory color, has thermoplastic nylon construction and smooth finish. It measures 4.5-Inch x 10-Inch x 0.22-Inch. This wallplate has 5-toggle switch configuration. It offers horizontal orientation and device mounting. Wallplate is UL listed and CSA certified.